Poker table playing cards scanner, it is a disappearing poker analyzer cheat, for it is installed in the edge of table. You don't need to take extra playing card cheating techniques, just need to put the poker analyzer in your pocket, and operate with a mini spy earpiece to hear the results. Something like phone poker scanner, or mobile power charger scanning camera, for that kind of camera, you need to put them on the table, and cannot move the scanner, you need to make sure that the playing cards scanner and analyzer code cards are in a straight line. However, it will be weird if you put something on the table for a long time, but don't move or use it. Table poker scanner camera comes to solve this problem. You can install barcode scanner camera inside the edge of poker table, so people cannot see it with normal eyes. You can be as a normal poker players, and don't need to put anything on the table, or don't need to wear anything on your body, just pay attention to texas holdem and omaha scanner system. 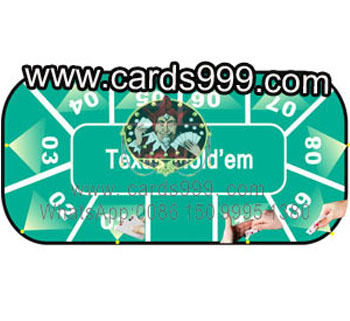 What's more, it is suitable for all signal frequencies, in other words, all kinds of poker card scanner can be used.